Terrier freshman forward, and Hockey East Rookie of the Year (video clip) Colin Wilson is one of several projected first round draft choices who were invitied to blog on the nhl.com Web site. Colin, ranked #10 by NHL Central Scouting and #8 by International Scouting Services (ISS), has made two lengthy blog posts: the first describes his pre-BU hockey development; in the second, he looks back at his freshman season, discusses another player expected to be drafted in the first round this June, and reveals his favorite team and player in the NHL playoffs. In the NHL.com “Draft Dandies” series, several members of the Central Scouting team assess Wilson’s game and offer some comparisons to his father, former Dartmouth and NHL player Carey Wilson. While Wilson is expected to return to BU for his sophomore season, Terrier fans are understandably concerned that the team that ultimately drafts Wilson might have a different scenario in mind. Coach Jack Parker addressed the situation in The Daily Free Press. As for Wilson, ranked ninth among draft eligible North American skaters by the NHL's Central Scouting Service, Parker said the start of the rookie's pro career will depend on the team that selects him in June's NHL Entry Draft. Though his rights will be owned by the pro club that picks him as an entry-level player, the decision to turn pro ultimately rests with Wilson and his family. is ready to play in the NHL, I say get going. If you wanna go, go. But a lot of that will have to do with what the pro team that drafts him thinks." From Parker's perspective, the decision should be a no-brainer for the reigning Hockey East and New England Rookie of the Year, who finished third on the team in scoring this season with 35 points. "There's no question he's a top prospect, but I also think there's no question he should be back here next year no matter who drafts him," Parker said. "It's gonna be difficult for him to step in and make the NHL next year. Some teams might think he's a prospect to play in the NHL because he's got the size and real good hands, but I think he knows he's developing here." Whenever Wilson reaches the NHL, he'll become a third-generation player in the league. His grandfather, Jerry Wilson, skated briefly with Montreal in the 1950s. John Curry's sterling first pro season continues in the AHL Calder Cup playoffs. Curry and the Wilkes Barre/Scranton Penguins, eliminated Chris Bourque and the Hershey Bears in five games and now move on to the divisional semifinal. Curry, who was named to the league's All-Rookie team, posted a 1.97 GAA and a .934 save percentage in the first round matchup with the Bears. In the USHL, 2009 recruit Max Nicastro registered his first playoff goal, but couldn't help Chicago from dropping its second game to Waterloo in the Clark Cup semifinals. 2008 recruit Chris Connolly and Omaha lead Lincoln, two games to one in the other semifinal. Connolly remains tied for the USHL post-season scoring lead with seven points. A USCHO pictorial by Melissa Wade of the Team USA training camp in Portland, Maine, features several shots (#s 4 9,10,19 & 28), of Matt Gilroy who is trying out for the USA National Team that will play in the upcoming World Championships in Quebec (see April 23 blog post). A wannabe Terrier is shown in shot #15. All three future Terriers participating in the IIHF World U18 Championships reached the medal round but only Corey Trivino will play for the gold, as Canada takes on the host Russian team on Wednesday. Trivino, who scored a hattrick and added an assist in Canada’s 4-1 win over Denmark in preliminary round play, has six points thus far in the tournament. Team USA lost in the semifinals, losing to Russia, 3-1, and meets Sweden in the Bronze medal game. on to the quarterfinals and faces Germany. Thus far, team Captain David Warsofsky has six assists and Vinny Saponari, subject of a USA Hockey profile last week, has two assists. Video of the gold medal game is expected to be streamed live --in Russian-- beginning at 11:00 a.m. ET. Go to CobinaTV. Scroll to the bottom and click on a green icon with the letters THB in the middle. When the small viewer appears, double-click on the video image and it will become full screen. If the bronze medal game is Webcast, it will begin at 7:00 a.m. ET on Wednesday. McKeen’s Hockey Prospects recently took a hard, analytical look at the two latest Terrier recruits from the NTDP program, addressing each one's strengths and weaknesses. Though Danny Kristo is considered the top-rated draft-eligible prospect in the U.S. National Team Development Program, there are a few others to keep an eye on, including winger Vinny Saponari. McKeen's correspondent Kevin Hopson provides an update on Saponari, as well as teammates Justin Florek and David Warsofsky. Vinny Saponari (2008), F, USNTDP-U18 A decent skater who lacks the necessary gear to blow by opponents, though he helps make up for this deficiency with his gifted puckmoving abilities .. owns an active stick and incredibly flexible hands, which – together – can make defenders miss .. crafty with the puck and can hold on to the rubber for lengthy periods of time .. also possesses a sneaky and precise passing game .. for example, he can pick up speed coming out of his own end, giving the impression that he is going to rush the ice however, he will sometimes dish the puck right before hitting full stride, reeling opponents in and causing them to over commit in the process .. enjoys astute vision on the ice, as he can find teammates in transition and even send a wing-to -wing pass across the mouth of the goal .. works most efficiently around the half boards and down low .. a special teams player who logs icetime on both the man advantage and PK .. though a respectable defender, his stickhandling expertise and aggressive nature on the forecheck are what hold value during penalty kills. 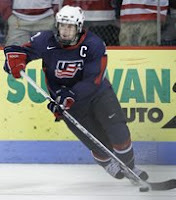 David Warsofsky (2008), D, USNTDP-U18 A mobile, puckmoving defenseman who can work in all three zones .. displays proper positioning on defense, as he does an effective job of cutting down angles and getting in the shooting lanes .. not afraid to initiate contact and get in the face of opponents.. utilizes the boards well, particularly in pressure situations .. plays a clean game for the most part, as he makes safe and precise passes in his own end .. has the capacity to skate the puck out of trouble as well .. can be dangerous in transition, as he possesses the gentle hands and smart vision to make a quality outlet pass .. also capable of keeping the puck and leading the rush himself .. does not look to shoot from the point that often, as he prefers to utilize his productive passing game to set up teammates .. however, he will pinch at times, as he loves to crash the net and be on the receiving end of a one-timer .. because of his puckmoving abilities, he sees regular time on the man advantage. The 45th annual Friends of Hockey Banquet was held last evening at the George Sherman Union. It was a pleasant evening weather wise and the turnout was a very nice one. In addition to the salute to the team members and departing seniors, there was a video presentation of hockey highlights of the past season..
A number of former Terriers who are now part of the Friends of BU Hockey Board were present including Chairman Paul Giandomenico, Dennis O'Connell, Brian Collins, and Mike Sylvia. Tim Regan, the MVP of the 1972 NCAA tournament, yielding just one goal in Final Four and shutting out Cornell in the championship game [Recap from Sports Illustrated Vault] and a BU Hall of Famer, attended along with his wife. An enjoyable evening for all I would say. Ex-Terrier and St. Blues assistant captain Keith Tkachuk’s 16th NHL season ended short of the Stanley Cup playoffs, but the Melrose, Mass., native reached a major milestone on the final weekend of the regular season. Tkachuk netted his 498th and 499th career goals in the Blues’ next to last game and then recorded his 500th in the season finale. He joins Joe Mullen, Mike Modano and Jeremy Roenick as the only Americans to reach the 500-goal plateau, and with 484 assists, he’s 16 points shy of 1,000 career points. This marks the first season with three BU All-Americans since 1997-1998 when Chris Drury and Tom Poti were picked for the first team and Chris Kelleher took second team honors. 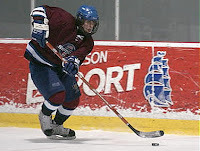 Gilroy, who recently decided to return for his senior year, was a second team All-American in 2006-07. He also was a first team Hockey East All-Star this season and last season. 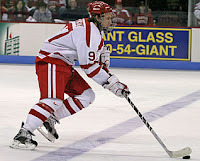 MacArthur, who finished his BU career with 147 points (18th best), also was a first team Hockey East All-Star this season and last season, and was named to the league second team in 2005-06. Ewing joined his two teammates as a first team league All-Star this season and had a career best 43 points.